Steve Jackson Games has announced a new card game, Muertoons Mix-Up. Steve Jackson Games is teaming up with Muertoons LLC and Surge Licensing, Inc. to bring a bit of Dia de los Muertos to your gaming table! 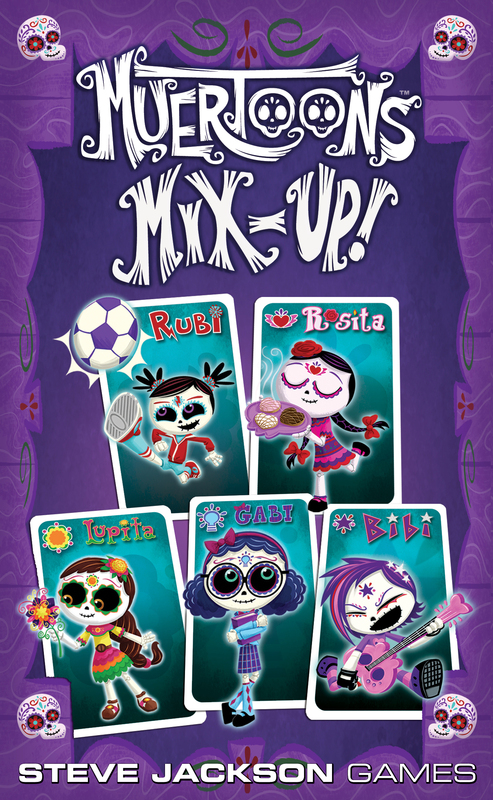 Muertoons Mix-Up, a card game based on the new animated series Produced by Wilmer Valderrama and created by Eric Gonzalez & Erich Haeger, lets you follow the Muertoons to the Dia de los Muertos celebration, despite Tio Rico’s best efforts. Tio Rico's up to his old tricks! You can’t find your way to the Dia de los Muertos celebration! Luckily the Muertoons say they can show you the way, but grumpy Tio Rico hates the noise and lights of Dia de los Muertos and is making things difficult. Play the numbered cards in the right order; the first person to discard all their cards leads their friends to the Dia de los Muertos celebration! "The Muertoons are a dash of tradition with a whole lot of fun,” said Erich Haeger, co-creator of Muertoons. “This game brings their unique world in to your own home and turns any game night into a Dia de Los Muertos celebration!" Muertoons Mix-Up releases in Spring 2015. "As Muertoons is brought to life through various forms of entertainment and media, we couldn't be more excited to 'reincarnate' our world through game play," said Surge Licensing VP, Elan Freedman. "And there is no better partner in gaming than Steve Jackson Games."